Mediterranean Brick Oven is located in the Southside of Richmond and owned by brothers Mo and Kal Jubran. 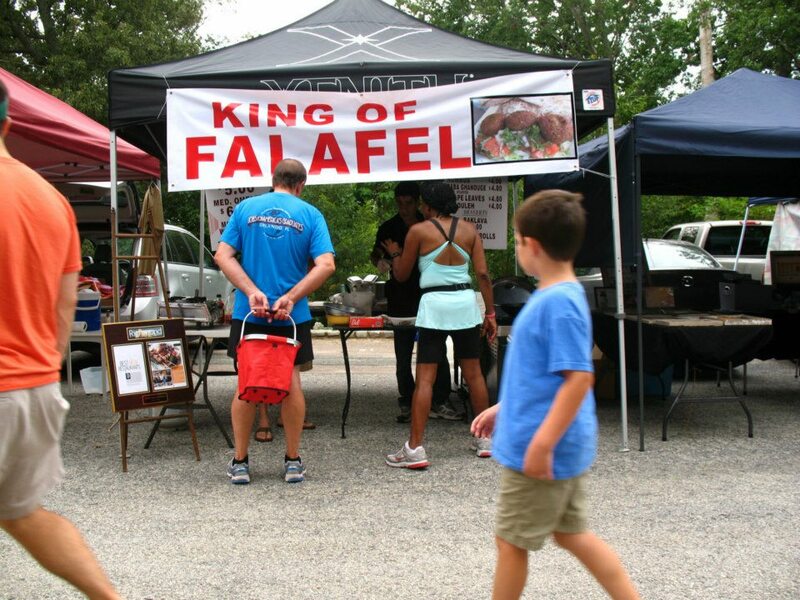 You can find them Saturdays at the SOJ Market under the rightful name “King of Falafel.” They specialize in authentic Middle Eastern dishes like hummus, baba ganoush, and, of course, falafel, and, at their store, you can find a Mediterranean Market with ingredients for your own Middle Eastern feast! We are Mo and Kal Jubran of the Mediterranean Brick Oven, known to the market as the King of Falafel. We sell freshly made foods from the Middle East, such as falafel, kabobs, hummus, baba ganoush, tabouleh salad, and baklava. Our kabobs and falafel are our most popular items. The kabobs and their spices smell very tempting off the grill. Our falafel is a healthy choice and it’s easy to eat as a sandwich. People seem to enjoy the toppings for the falafel–especially when we have pickled cabbage. We have been in business for two years. I think people have dreams of starting a food business because first and foremost they like to eat. The same holds true for us. We enjoy bringing the fresh and healthy foods that you hear about from the Middle East to our customers here in the neighborhood. We love trading for fresh vegetables that we don’t grow at home throughout the different seasons. And eggs when they are available. It’s one of the perks of being a vendor at such a dynamic market! We arrive to the market early to set up and start the grill. We set out our wares and look forward to seeing our customers. Part of the fun is just being outside amidst all the Richmond faces and other vendors. Come by and say hello next weekend!